Cedar Shingle Siding is a great way to enhance the exterior of your home! Siding in the form of Cedar Shake Shingles will make your home stand out over all of the others on your block! Cedar Shingle Siding is timeless and because of the warm undertones that it is available in it blends well into your natural surroundings. Although shakes and shingles are similar wood siding products, they do have some vast differences. Cedar Shake Shingles are generally sawn on both sides where shakes are primarily split on one side. Cedar Shake Shingles are also more precisely milled that shakes. Cedar Shake Shingles are also thicker than a shake. Cedar Shake Shingles give a more uniform appearance than shakes. How long will Cedar Shake Shingle Siding last? If installed correctly, cedar shake shingle siding can last up to 50 years. Although Cedar is considered a durable material many manufacturers do offer 25-year warranties. How much does Cedar Shake Shingle Siding cost? On average cedar shingle siding costs about $6.00 to 15.00 per square foot to install. In total a homeowner can expect to pay a licensed contractor around $10,000 to $25,000 for an average sized house. A large part of the installation cost can be the removal of existing siding. What are the overall advantages of Cedar Shake Shingles? With the building market being flooded with faux products these days people are straying from natural products. When it comes to siding, if you want an authentic wood look the original material is the way to go. Although vinyl sidings can offer a clean look with the appearance of natural grain, the look of true cedar can’t be beat! Cedar Shake Shingle Siding can be left natural or treated with oils, paints, and stains. In the end Cedar Shake Shingle Siding is less expensive than any vinyl siding. Cedar Shake Shingle Siding also reduces noise and is a natural insulator against extreme temperatures. 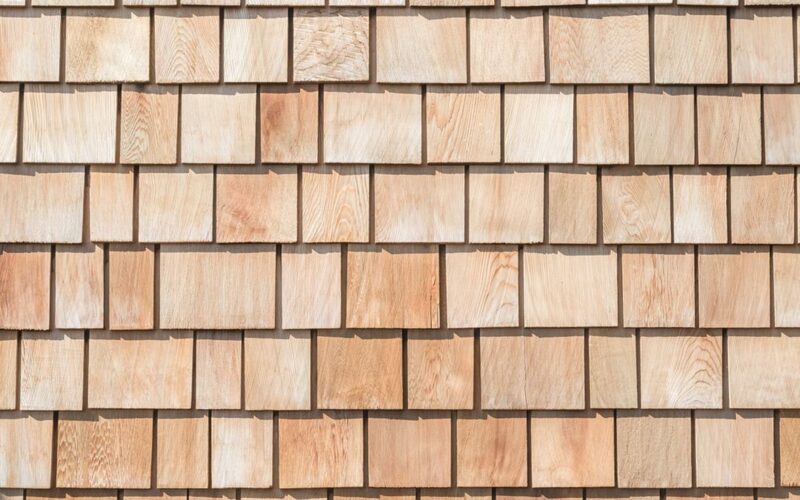 How many varieties of Cedar Shake Shingle Siding are there? Most of the Cedar Shake Shingle Siding that is on the market today will either be red, yellow, or white cedar. Western Red Cedar Shake Shingle Siding – Western Red is naturally insect resistant, durable, and flexible. It is long lasting and warps less than other types of cedar. Yellow Cedar Shake Shingle Siding – Yellow cedar is heavier than red or white cedar because of the amount of natural oils in the wood and because of the tight grain. It is also insect resistant and sheds water naturally. White Cedar Shake Shingle Siding – White cedar is considered one of the finer grades because of its distinctive coloring and scent. It is also long lasting and resistant to insect and weathering. If you are considering replacing the siding on your home, Cedar Shake Shingle Siding is a budget friendly and beautiful way to go. It will keep your home looking authentic because it is an entirely natural product! Here at Rocky Mountain Forest Products, we would be happy to help you along in the process!